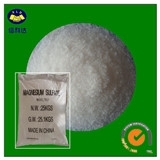 Magnesium sulfate Suppliers, Magnesium sulfate Manufacturers. Uses : As a main materials in fertilizer. Also can be used in stock feed additive leather, dyeing, paper making ,pigment,the medical oral laxatives, refractoriness, Ceramic, match dynamite and Mg salt industry. Product description: 1.Chemical and Physical Properties: Product Name: Magnesium Sulphate CAS No. :10034-99-8 EINECS NO. :14168-73-1 Molecular Formula: MgSO4.7H2O Molecular Weight: 246.47 H.S Code: 2833210000 Appearance: White crystal Powder Easy soluble in water, slightly soluble in ethyl alcohol and glycerol.Relative density:2.66g/cm3(anhydrous),Melting point:1124 ℃ 67.5℃ soluble in their own crystallization water, air-slake easily in the dry air, heated to 70～80℃,lose 4 crystal water, 150℃,lose 6 crystal water, 200℃,lose all of crystal water. 2.Usage: As a main materials in fertilizer. Also can be used in stock feed additive leather, dyeing, paper making ,pigment,the medical oral laxatives, refractoriness, Ceramic, match dynamite and Mg salt industry. 3.Specifications: Standard: HG/T2680-95 Item	Specification Magnesium Sulphate Heptahydrate	Magnesium Sulphate Monohydrate	Magnesium Sulphate Assay %≥	99.5	99	99 MgSO4 %≥	48.59	86	98 MgO %≥	16.2	28.6	32.6 Mg %≥	9.8	17.21	19.6 PH value(5% water solution)	5.0-9.2	5.0-9.2	5.0-9.2 Iron(Fe)% ≤	0.0015	0.0015	0.0015 Chloride(Cl)% ≤	0.014	0.014	0.014 Heavy Metal(Pb) % ≤	0.0006	0.0008	0.0008 Arsenic(As) % ≤	0.0002	0.0002	0.0002 4.Packing Details: The goods will be packed in N.W25kgs or 50kgs plastic woven bags within PE liner or as request. 25Tons will be loaded in 1*20’fcl container. 5.Storage: Store in a cool, well-ventilated area. Away from the fire, heat source. Prevent direct sunlight. Packing sealed. Should be stored away from oxidant, avoid by all means is mixed store. Storage areas shall be with the right material for leakage content.